When our Mexican trip turned in 2012 from Holy Grail/Bucket List journey into amazing reality, there was no doubt of what our choice of abode would be on the Mexican Caribbean coast: a small, beautiful and inspired family owned hotel set in the center of a small Mexican town, Tulum. Already being familiar (virtual as it may be) with the owner of this cozy oasis, Robbie Schmittner, after he so kindly gave mydive.ro an interview soon after he established a connection between two cave system in the Nohoch Nah Chich region, it was a no-brainer that our first stay in the Yucatan would be in Xibalba Hotel, close to the cenotes (yes, of course we went there to dive), the amazing Caribbean Sea and the rich Mayan ruins. 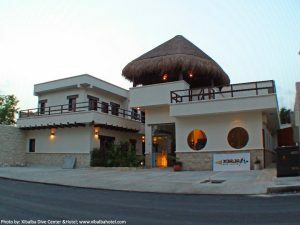 The tiny seven-roomed dive hotel, opened in 2008, came after Robbie and Aneke Schmittner opened the doors to Xibalba Dive Center in 2004. Both hotel and dive center were named after the Maya underworld, Xibalba, the place beneath the earth where spirits and the “Lords of Xibalba” lived. Even the two types of rooms (for 2 or for up to 4 people) were named after Mayan hero twins: Hunahpú and Xbalanqué. The myth tells the story of the father and uncle of the twins who are summoned by the Lords of the Underworld and are defeated in a traditional ballgame. The two twin sons, after many trials, are finally avenging their family in the ballgame and defeat the Lords of Xibalba, later becoming the sun and moon. 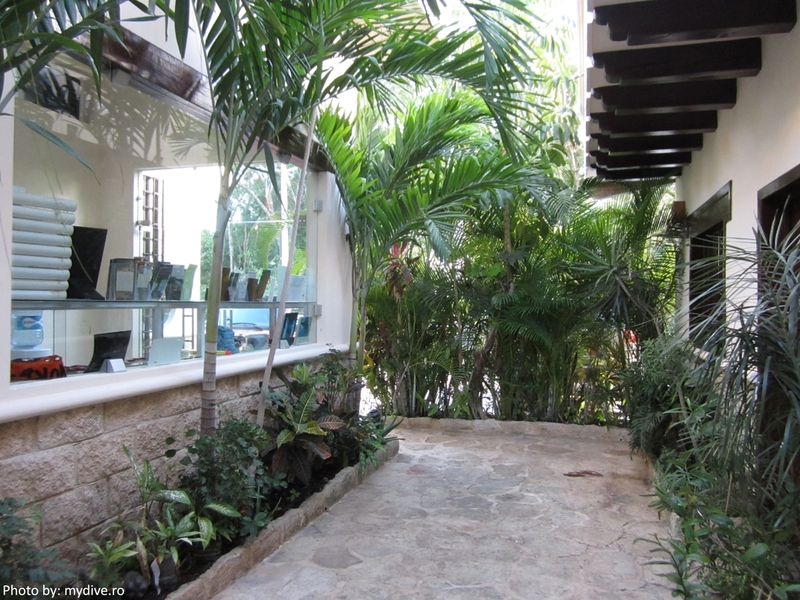 The story adds to the magic of the place, a small corner of green and quiet hidden in the heart of Tulum. To reserve the hotel we exchanged some emails with Robbie or Richie Schmittner, depending on which of the two German brothers was available (they usually split their time between diving and reception) and even with the time difference we never had to wait long before we got an answer to our many inquiries. 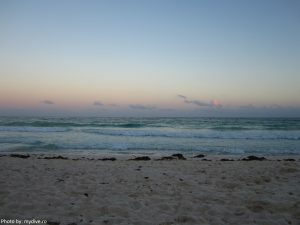 Because the airport where you will probably land is in Cancun while the hotel is located 130km to the south, if you specify, Xibalba can arrange for you (it’s usually included in the package) the transfer from the airport to the hotel, but when you leave you’ll have to pay for it separately or arrange it yourself. 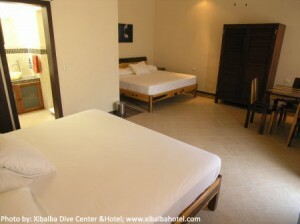 Being a dive hotel you can choose from hotel and dive packages, just diving or just hotel reservations. We chose the first as it seemed more convenient to live and dive from the same location and you can always add extra days of diving if you feel like it. The hotel and adjacent dive center are situated a block away from the main road through Tulum, very close to the main junction from where it’s easy to head in any direction: beach, Maya ruins, the center of the town or Cancun etc. Being a three minute walk away from the louder main street where you will find most restaurants and shops, the place is perfect for relaxing after a busy diving day. Close by you can find two supermarkets if you want to shop for some groceries or you need something fast. 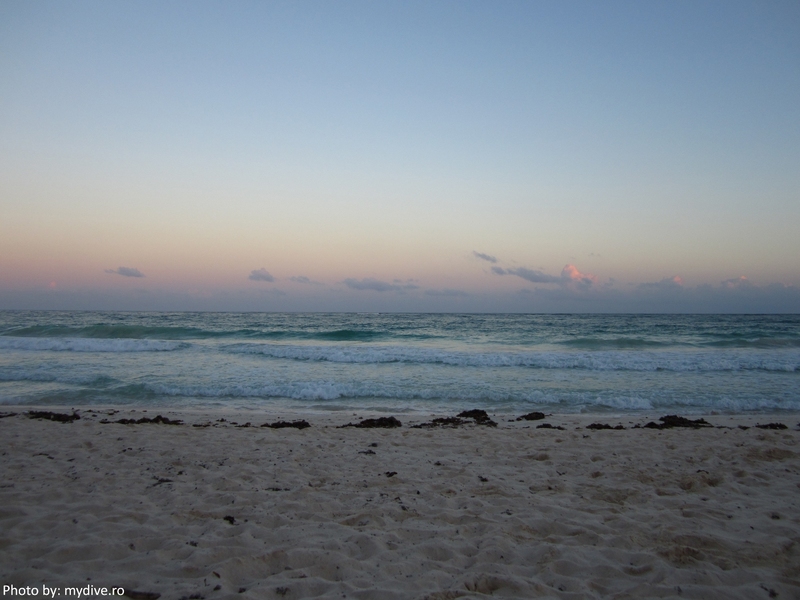 Two blocks away from the hotel you can find the road to the beach: it’s a 30 minute walk (walking the streets day or night feels safe and comfortable), you can rent a bike (we learned that “bikes are freedom” in Tulum as you can fast and easy reach a lot of spots – there are special routes for bikes) or take a taxi (taxis are not expensive). 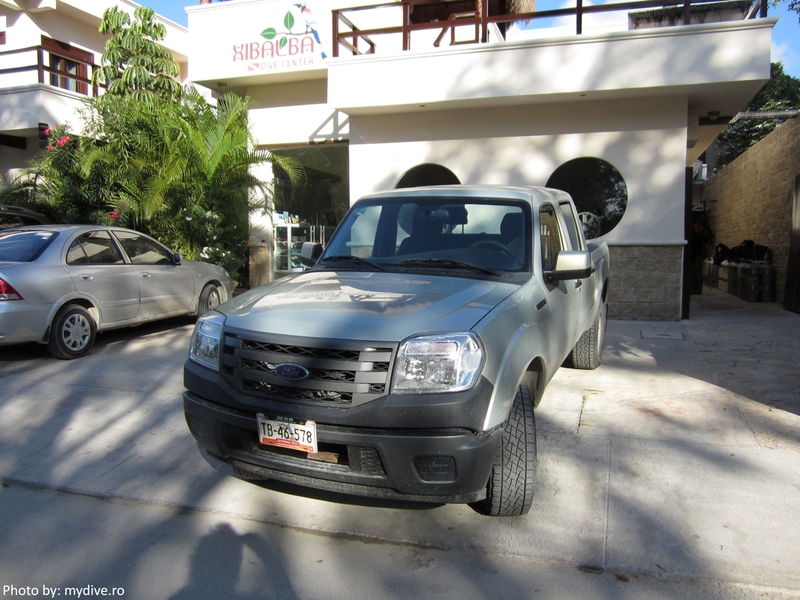 If you’ve arranged the transfer with the hotel, the trip from Cancun doesn’t take long, the roads in the Yucatan are very good, the only annoyance are the bumps in the road set to control your speed. The locals will know where they are, but if you’re thinking of renting a car and driving it, be aware, otherwise you’ll risk damaging your rented car. We developed a buddy system between the driver and the “copilot”, with the second always yelling “tope” (that’s the name of the bump in Spanish) each time he/she saw one. The hotel is simple, clean and has spacious rooms, each furnished with one or more comfortable beds (the double bed is huge), a wardrobe with a safe inside, beautiful wooden table and chairs and, of course, air conditioning. 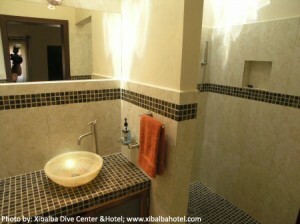 The bathroom is gorgeous, with a proper big shower. 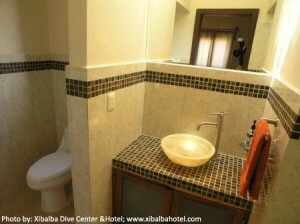 The only thing you have to be aware of is that you’re not supposed to throw the toilet paper in the bowl, but if you’re used to going on dive safaris it should sound familiar. Tomas will come and clean your room every day, so all is fresh and clean. The seven rooms of the hotel are situated on the ground and first floor with different vantage points, be it the garden, the street or the neighboring lush lots. 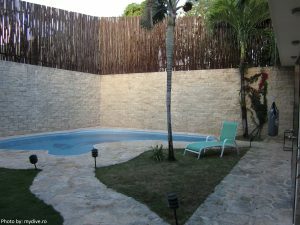 There’s a small swimming pool in the garden and a roof terrace for breakfast and relaxation. In the courtyard there are several lines where you can hang your bathing suits to dry. You can even park your rented bike close to the back wall in the yard. For those who rent a car it’s good to know you can park it right in front of the hotel. There’s a night guard, so if you have security issues you can relax. There’s free Wi-Fi on the hotel’s grounds, just be aware that sometimes in the room there’s a weaker signal compared to, let’s say the terrace. There’s a complimentary breakfast offered to the hotel’s guests: simple, honest home-style breakfast prepared by lovely and kind Ana, Tomas’ wife. The breakfast is served on the roof terrace and you can choose from coffee, orange juice, yoghurt, granola, fresh papaya, pineapple, melons, bananas, toast, eggs cooked to order (boiled, poached, omelet, scrambled with ham, cheese, tomato, onion etc. ), pancakes, marmalade. More than enough for anyone! 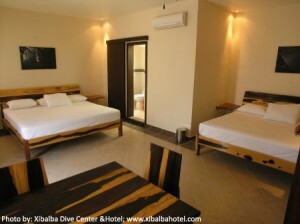 Being a dive hotel, of course, you can dive. 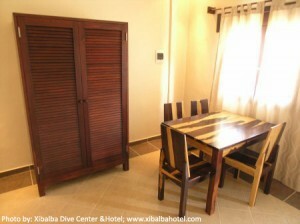 The hotel reception is the same as the diving center’s reception, with all you need two steps away. You will need to talk to the guys to decide your dive schedule, so they can prepare the day and the necessary equipment. 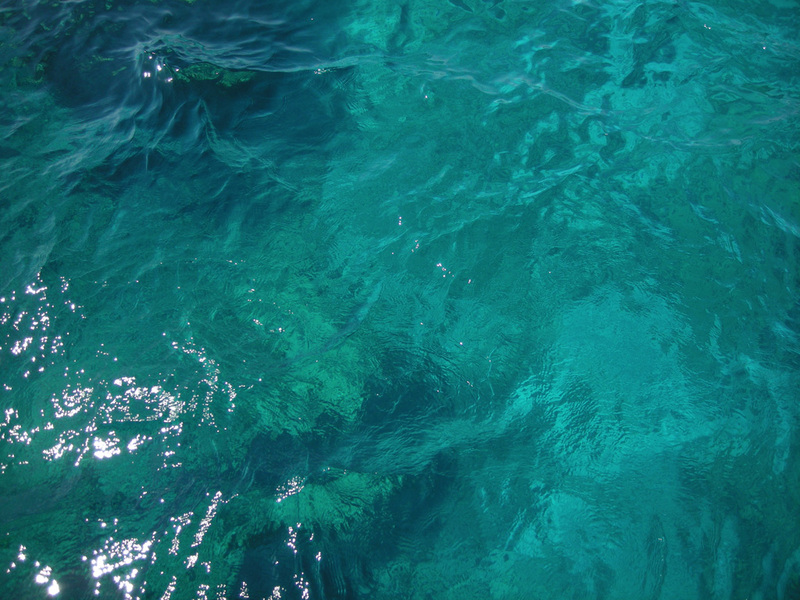 The team is very friendly and helpful and the diving is amazing, so it’s recommended if you are in the area. When we were there the three guys (Robbie, Richie and Hairo – our dive guide) assisted us with everything we needed, dive related or not. 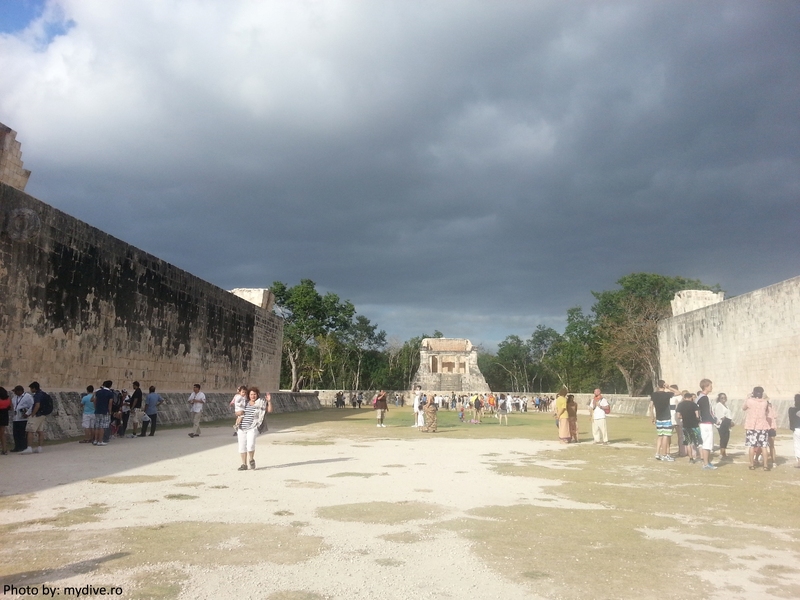 They helped us in booking a tour for the Sian Ka’an Nature Reserve through CESiaK and they even put in the deposit on our behalf as they arranged everything when we were away visiting the Maya ruins. All in all there’s a very relaxed, informal atmosphere, the staff is there when you need them, yet not really there to bother, you feel left alone, but not deserted. If you wish for a quiet simple and authentic Mexican experience combined with some German flavor then you should definitely choose Xibalba, a dear place to us that we recommend wholeheartedly.